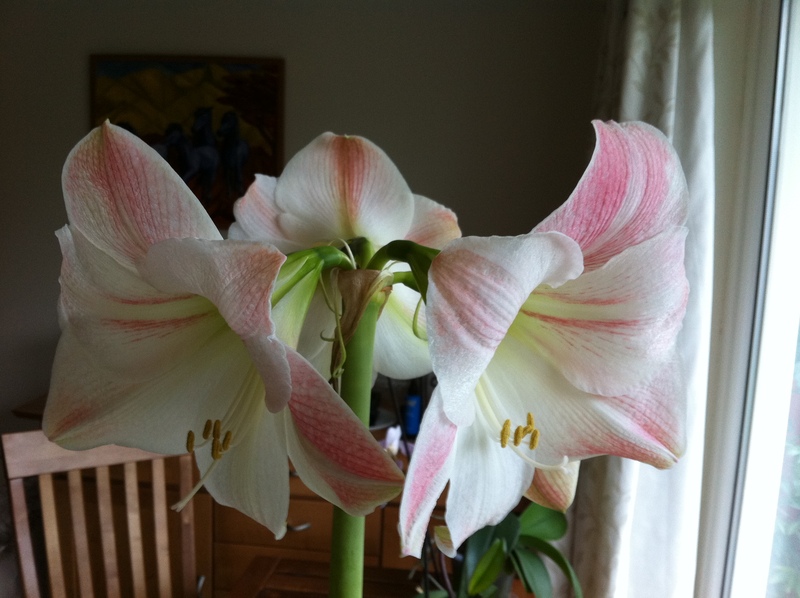 Last year — around this time — I bought an Amaryllis “Apple Blossom” (I know that they should really be called Hippeastrum). I wanted one after seeing one in flower at the parents’. I just couldn’t get over the fat onion-sized bulb and the single tall green spike upon which sat four voluptuous flowers, pointing in the compass directions. I had to have one and when they were reduced at the supermarket, I got one. I took several pictures of it as it flowered last year and it turned out to be a real stunner, not just once, but twice as it produced two flower spikes in succession. This was full-on flower-power when it was needed the most; in the depths of winter and it really cheered me up seeing it each day. After all the flowers withered and dropped and the bulb was looking a little spent, I cut the old flower stalk down and continued to occasionally water it and generally keep it alive while I figured out what I was supposed to do with it. I read that some people treat Amaryllis as a use-once-and-dispose job, as they are so cheap from the supermarket you can just throw the spent bulb out and buy another one for next year. After all the enjoyment I got from it, I didn’t have the heart to do that so I potted it into a larger pot with fresh compost (keeping the bulb neck proud of the surface) and once the weather began to warm up in Spring, it went outside into the full sun. The bulb grew a set of long strap leaves and the whole lot stayed outside over the Summer. We had a some hot days where it got rather hot and very bright but I didn’t shelter the Amaryllis from that (general literature says you’re supposed to). I let the leaves soak it up and they didn’t seem to suffer from it. On the hottest days, I felt I could almost hear the roots hoovering up water and see the leaves pumping nutrients back into the bulb. As Summer moved into Autumn, we brought the Amaryllis back inside, gave it a really good soak and then went on holiday for two weeks. Over this time the bulb wasn’t watered nor was the house kept heated, the low light (from being indoors), the lack of water and the the cold must have triggered something in the bulb. When we got back, the heating was turned on and I watered the Amaryllis pot since it had gone bone dry — it had also lost the oldest couple of leaves, but still had a healthy set of about six. 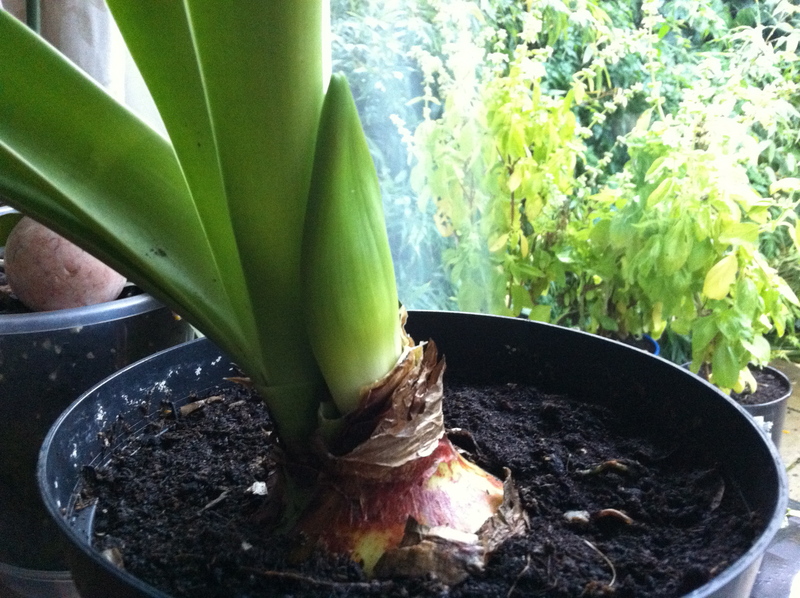 It looks as though the Amaryllis is beginning to flower again – woohoo! The rate at which the new spike is growing tells me that it is definitely running on bulb juice. Now I just wait, and I’ll be seeing those flowers once again in a month or two.